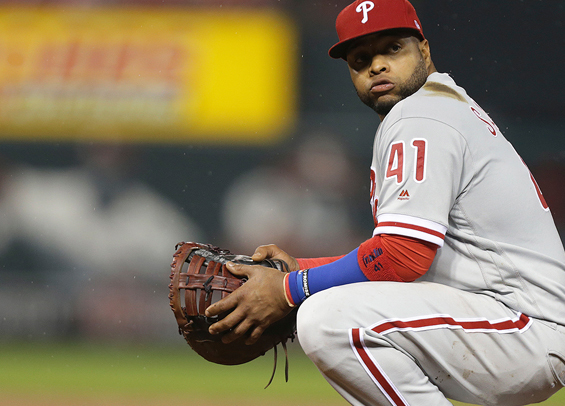 It's becoming quite obvious the Phillies are trying to move on from veteran first baseman Carlos Santana. However, it may not be as simple as shopping him around on the open market. Jayson Stark reported on Monday the Phillies were in talks with the Diamondbacks regarding a potential trade for slugger Paul Goldschmidt. His sources, however, said talks fell apart when the Phillies attempted to pack Santana and his contract into the deal. Santana, 32, is owed nearly $42 million over the next two seasons and is coming off a year where he hit just .227, a career low. He did, however, finish with a 105 OPS+ to go along with 24 homers and 86 RBIs. Goldschmidt, 31, is a career .297 hitter and slugged 33 homers last season to go along with 83 RBIs. In eight big league seasons he's been named an All-Star six times. He is owed $14.5 million next year and becomes a free agent after 2019 where he'll command a sizeable contract. The Phillies are looking to move Santana to make room for Rhys Hoskins at first base, though adding Goldschmidt would likely trump those plans leaving Hoskins in left field.